Construction of a bore hole at Unangwa Community PADI Centre is aiming at providing clean and safe water to 7,358 people (4,300 women, 3,058 men). Unangwa Community PADI Centre is among different programs formed by PADI aiming at supporting vulnerable groups. The centre has been established at the moment is supporting over 7,000 people from different groups of older people and disabled people including revolving goat scheme( with 2,100 beneficiaries),micro-finance scheme (with 1,300 beneficiaries),Community health Fund support (with 3,000 beneficiaries) and older people Home Basic Careers volunteers (with 958 people). The services offered by the centre include venue for trainings-entrepreneurship skills training, meetings, seminar-in near feature the centre is going to conduct older people and disabled clinic services. All these services need the availability of clean water, at the moment the centre has tape water which is not supplying enough water according to actual requirement of water due to fact that water supply from the tape is being supplied at interval of every after two to three days per week and some times over three days while the centre need to have daily water supply for drinking, gardening, for toilets and hall sanitation and flower growing/watering. The present source of water at the moment does not suffice the requirement of the centre. In this case their fore request for funding from Blue Planet Network is presented in order to construct a bore hole with a plastic tank with capacity of 5000 liters to minimize the gap as the present source of water is only able to support few activities than the present plan. 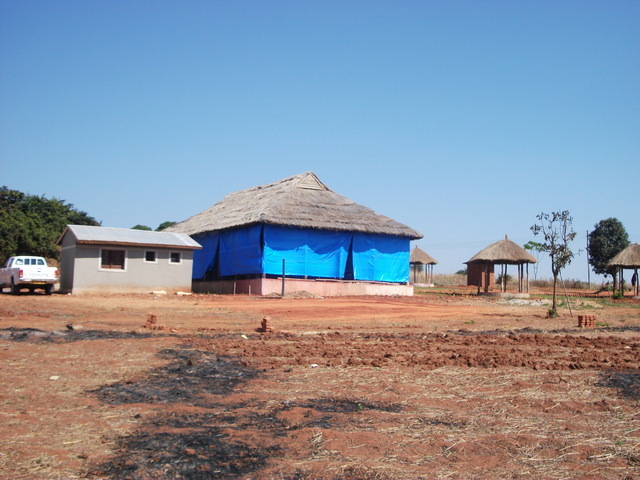 Even after the construction of 73 improved traditional water wells and (8) bore holes in the district (to the community and schools) the need to expand the project to other areas is still high (more than 3 requests from community and 2 schools have been received this year) including Unangwa Community PADI Centre. i)	Mobilizing community to full participate in project implementation. vi)	Conducting one day training to 10 WMC on how to care and maintain the pump and pump house. The available tape water is only able to support 50 people(30 women and 20 men) arround the centre instead of supporting over 7000 people according to the plan of the centre. 150 of the beneficiaries are women and 50 people are men who are participate in monitoring meetings,seminars and other entrepreneuship skills works (mostly are the group and zonal leaders in variou projects. The proposed water supply from a bore hole: The existing facilities include electricity supply which runs along the proposed site. A bore hole to be drilled in the area to the depth of 40m and installed with PVC pipe casings after well development and pump test target well yield a minimum of 2000litres per hour. A water tower to carry the 5000 liters plastic storage tank will be constructed. Also electricity supply to power the pumps will be required. 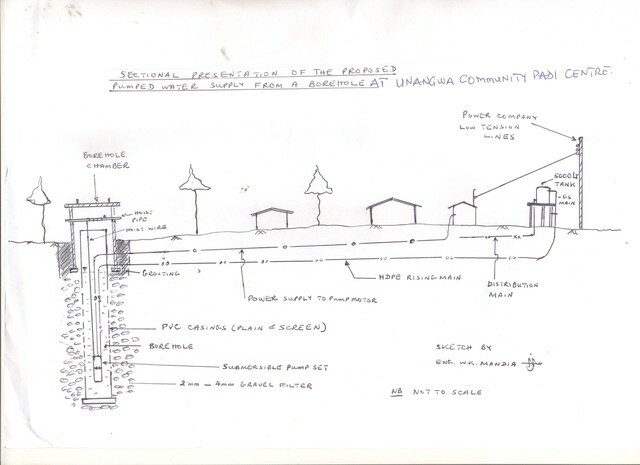 In addition pipe lines to carry the water from the bore hole to the tank and distribute the water to the distribution point/consumers points from the tank, after conducting water quality analysis at water laboratory (see the attached sketch). The work is going to be done by experienced drilling companies with both manual and mechanical/electrical drilling equipment at reasonable rates. The is in site for the borehole is in a sparsely populated area. PADI has been implementing this kind of water project for more than 9years, beginning in 2003. The first implementation of the project was done in Mletele ward at Liwumbu B streets from June to August 2003, where (7) improved local wells were built. PADI received funds from Peace Corps Tanzania organized by Mr. Tim Hogan. The second implementation of the project took place from September to November 2003, where PADI received funds from professors Miller and Rulfs of the USA and constructed 4 improved local wells in the same ward. The third project implementation took place from October 2005 to December 2005, funded by Help Age International, which enabled PADI to build 8 improved local water wells while the fourth implementation took place from July – August 2007, the project funded by Run For Africa, the funding enabled us to construct 13 improved traditional water wells and 1 bore hole. The fifth project implementation took place from November 2007 to January 2008 where 7 improved traditional water wells were built, funded by Help Age International while the sixth water project implementation took place from September 2008 where 34 improved traditional water wells in Mshangano ward were built for the community and 3 bore hole were constructed in three secondary schools funded by Blue Planet Run Foundation –BPRF. The seventh water project implementation took place in 2009 /2010 where two secondary schools (Londoni and Mbulani) benefited from the project, each school got 1 bore hole while the eighth project implementation took place in 2010/2011 in two schools (Maposeni and Zimanimoto Secondary Schools) each school got one bore hole. The community will be involved in all process of project implementation from site survey, project monitoring, forming water well committee and water maintenance fund, forming Water maintenance fund (WMF) and paying electricity bill and electricity service line costs. When the pump is successfully installed. The Centre plan to grow varieties of trees, fruits and vegetables within the centre which owning over 13 acres of the surveyed land for various services to Vulnerable older people, disabled and other marginalized people. To make the project sustainable the following action is going to be done. i. The community of the centre will form committee consisting 10 members (5 men and 5 women) to support monitor the pump progress from the beginning of the project and after. ii. The Centre will be sensitized to form Water Maintenance Fund (WMF) which will help to support paying electricity bill, pump maintenance. is fund requested from Blue Planet Network. Electricity Service line costs will be contributed by the community including paying monthly electricity bills and forming Pump maintenance fund. It is planned to collect a total of $ 1111 for electricity service line costs,$ 5 for monthly electricity bill and $ 300 as maintenance costs, all these funds will be contributed to the project by income earned by the community from renting Unangwa Community PADI Centre meeting Hall which is giving an income ranging from $100-400 per month since may 2011 when it was officially opened. I want to thank you for your interest in supporting the people of Unangwa with safe drinking water. I would like to know which type of electricity you are using to draw and supply water to the respective points of the beneficiaries and how effective is it. Secondly, on whose account do the people pay there electricity bills? Thirdly, which type of pump do you intend to install after completion of the bore hole? The type of electricity we are using is from Tanzania Electricity Company (TANESCO) which is stable in Ruvuma region –always the supply of electricity is good, is ranging between 12-24 hours , but in case of any problem from this source the community has a stand by generator. Is the submersible pump which will be connected to electricity instead of Hand pump see the attached sketch of the water system we plan to have. I echo many of my colleagues questions above regarding electricity and the affordability of the system for the community. What is the consistency of the electricity? Is it stable? Are there electricians in the community who are capable of repairing it when it is broken or would someone from outside have to come and fix it? I'm not sure I see where you are addressing sanitation? It says there are 7,358 people getting sanitation. Perhaps there was a mistake and it was meant to be inserted in the # of people getting access to clean water. Will you be water testing to ensure that the water will be safe? I echo many of my colleagues questions above regarding electricity and the affordability of the system for the community. What is the consistency of the electricity? Is it stable? •	We have consistency supply of electricity from Tanzania electric Company(TANESCO) which is at least the supply of electricity is covering 12-24hours per day, but in any case of emergence, the community has also stand by generator which can support to pump the water to the tank. •	The community does not have her own electrician but will be hiring from outside(so long the centre is very close, is almost 6km to Songea town, therefore is easy to get them at low cost which can be managed by the community. Are there electricians in the community who are capable of repairing it when it is broken or would someone from outside have to come and fix it? Is someone from outside the Community? Is very true what you suspect. The problem has come as we noted that the details demanded the number of people who will be getting sanitation. Thank you for your observation. Yes in our budget we have indicated budget line for water analysis (testing the quality of water). 1. Will one day of training for the Well Maintenance Committee suffice? 2. Will individuals from your group inspect the wells every few months or is the well inspected solely by the 10 people of the well committee? What kind of inspection process do you have in place? How often will the site be visited? Please expand on your plan for maintenance and upkeep. 3. How often will the water be tested for contamination? Who will test the contamination of the wells? The Well Maintenance Committee? Is this also part of their training process? 4. Will the current of electricity be strong enough to sustain the system? Who is responsible for upkeep of the electricity? 5. Will the well provide enough water to sustain 7,358 people? What is the estimated usage per person/per day? 1.Will one day of training for the Well Maintenance Committee suffice? Firstly water is planned to be tested soon after getting water before insuring the pump. The Government water authorities SOWASA will be used in testing the quality of water. Of course the committee will be responsible to do miner maintenance including cleaning the tanks and repairing tapes while major problems will be reported to other exparts. 4. Will the current of electricity be s trong enough to sustain the system? Who is responsible for upkeep of the electricity? Yes electricity is strong enough to sustain the system. - Where is the center? Are the 2-3 buildings drawn the center? Where is the new construction? - Where is the location of the borewell? Have you found an appropriate location using a water diviner or hydrologist? - Why not have the overhead tank right next to the borewell and reduce all piping costs? You only need piping for distribution then. 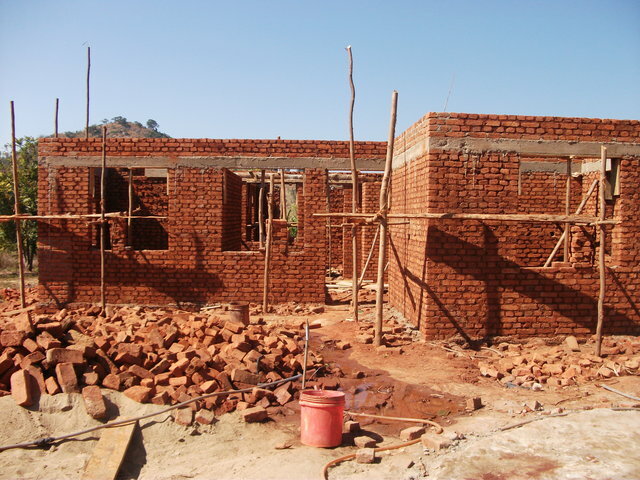 Generally the center is having 14 acres of land planning to continue constructing building including Hostel for Facilitators, participants during long workshop and training, also it will be part of Income generating for Unangwa community PADI Center and other buildings for older and disabled clinic. The centre is new is planning to have several buildings as stated before. It sounds like you are doing incredible work and impacting the lives of so many people in Tanzania. Congratulations! The questions I have regarding your project relate mostly to the number of beneficiaries. What distance are most of the beneficiaries from the Centre? Is the use of this water mostly for them while at the Centre or is the idea that they will carry the water back to their homes? How many people do you estimate taking water from the bore hole daily? If there are huge numbers, like 7,000, how is this managed at the water point? With potentially so many people drawing from the well, it seems like it might be a logistical challenge. How do you plan to address this? Hi Kristen, thank you for the good questions. It is true that the number of beneficiaries is big but all will benefit from the source of water we intend to build. I. The distance from the beneficiaries differ from one group to another ranging from 2-10 km. II. They will only use the water while they are at the centre attending entrepreneurship skill training, monitoring meeting, annual meeting, and cerebrating international day for older people and in near future we plan to build hostel and clinic for disabled and older people. The number of people who attend at the centre per day does not exceed 200 in average. But our beneficiaries who will be attending to the centre to get various services are more than 7000. In this case therefore we don’t expect to face a big challenge. The water will be supportive to the named number as they will be not using all the named number per day but will use in different days according to programs. Please adjust the numbers in the application. Since it is not a home/community project, the number of people who get safe drinking water should be zero. Also the number of people who get sanitation should be zero. The number of people who benefit from coming to the center should be put under "Number of People Receiving Other Benefits". They get this water benefit only on their visits. Thank you for your advice, I adjust as you have adviced us to. 1. Aim is to provide water to 7,358 people. What is the number 50 in the application as ‘getting water’ signify? 2. regarding “vi) Conducting one day training to 10 WMC on how to care and maintain the pump and pump house” Is one day training enough for the committee? Do you need to go back to check upon how the maintenance is running of the earlier projects every 6 to 12 months? Do you have any sort of inspection scheduled to track such projects? Due to lack of proper maintenance or simply change of person(s)-in-charge of maintenance leads to close down of such projects. 3. Great to see that the experts from the government sector will be involved. From where would these experts travel from? 4. Do you have exact geographical location of the site/ school? Or can you get it later? There are no geocodes or coordinates recorded of the projects of 2011. Cost of a handheld GPS does not cost much nowadays and it is user friendly too. 5. I like the method of paying for the maintenance of $300/- Will there be need of paying service fees to anybody from outside to repair any fault? It is great to see that the members of the WMC will do any kind of maintenance job free of charges. Is it simply because they are beneficiaries or do they hold other job within the community and this responsibility is added to their regular job? 1. In the budget it is mentioned that submersible pump will be used so what is meant by construction of pump? What is the brand name and/or supplier of the submersible pump in Tanzania? 2.Can you specifically mention the activities that cost $297 for mobilization and demobilization and $ 1080 for what sort of monitoring please? Thank you for your hard work in the projects. I also want to echo Meera's question#2. Please provide a description of how this project will be maintained based on the workshop(s)/training(s)? If possible, please provide Indicators for monitoring and evaluating capacity building for this important role. I also want to echo Meera's question#2. Please provide a description of how this project will be maintained based on the workshop(s)/training(s)? Workshops and training also will be including marriage and other parties by municipality community are targeted to be held at the multipurpose hall. The revenue raised will be channeled towards operational and maintenance costs and other Community PADI Centre activities. All these activities require stable water supply at water closets (WCs) flushing systems. If possible, please provide Indicators for monitoring and evaluating capacity building for this important role. The 50 people in the application are the beneficiaries who are receiving the water services from the water tape in the Centre but are not enough to support large number of beneficiaries because of a very limited supply of water per day as we explained the problem of the tape water in the area. The committee members are usually given basic skills which enable them to discover and repair miner problems and report some big issues to be done by technician. One of the main role is to make sure the environment of pump is clean and any problem which make malfunctioning of the pump is reported to the authorities for further action. We always visit the projects/pump sites regularly /but also we do receive monthly report of the pump functioning monthly is the Monthly Monitoring meeting which consist representatives from various projects including water project. 1. Aim is to provide water to 7,358 people. What is the number 50 in the application as ‘getting water’ signify? 2. regarding “vi) Conducting one day training to 10 WMC on how to care and maintain the pump and pump house” Is one day training enough for the committee? Do you need to go back to check upon how the maintenance is running of the earlier projects every 6 to 12 months? The committee members are usually given basic skills which enable them to discover and repair miner problems and report some big issues to be done by technician. One of the main role is to make sure the environment of pump is clean and any problem which make malfunctioning of the pump is reported to the authorities for further action . Do you have any sort of inspection scheduled to track such projects? Due to lack of proper maintenance or simply change of person(s)-in-charge of maintenance leads to close down of such projects. The centre is within Songea Municipality ( 6Km far from the songea to the centre). 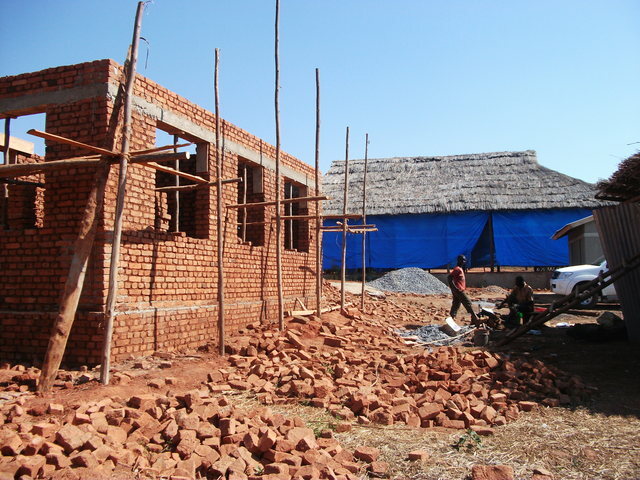 The community has funds earned from their meeting hall. Having a hall within Songea Municipality is very luck. It is a good source of income for the community as it was well elaborated in the proposal. But another source which can be used to set aside for Maintenance purpose is from individual contribution in case they fail to get income from the meeting hall as the majority of the people in the community deal with income generating activities with enough savings each. 1.What is meant by construction of submersible? 2.POWER SUPPLY-The area (site) is connected to the power company(Tanzania electricity supply Company )electricity supply. The are many models to choose from eg KSB(Germany),Grondifos (Danish)CORVECO(Italy) and models from China. •	Quality of materials supply. The involvement of the community in the implementation process of the project sounds good and the formation of of the WMC will also ensure sustainability if only they can be given proper training and avoid the dependence on the IP for major maintenance. This is a well-planned project in a very monitored community. Initially I gave a score of 8 but reading through it properly and going through the budget second time lowered the score because 1) only 50 persons will be catered that makes the cost per person of the borewell very high, and 2) cannot include 200 persons receiving other benefits since the amount spent on it is only $297. And also for group of 50 persons the maintenance cost seems to be high. Hope O&M does not stop after a couple of years so update on such large projects are always helpful to score current application by viewing the historical ones. Hence in the background section of the application, description of other projects implemented is given but the current status of those projects is not available. It is advisable to give a status report of all the historical projects in the background section perhaps or upload a brief report of the past projects since monitoring is ongoing as mentioned at the Q&A forum. I'm a little worried about the electricity factor because it is inconsistent, as well as the fact there is not a local electrician who can fix it who is part of the community. Otherwise, it is a worthy project! This project is very difficult to justify from a cost-benefit perspective. In reality, only 50 beneficiaries will directly gain from this investment of $11,000. This is a good project for a community. As it is geared towards a community center, the question is how will be it translated as an example for the community and how will it grow towards being an example and role model towards creating greater coverage of the entire population. Its not clear that this solution is the way to go or the entire community - if it is, then fine, but from PADI's earlier projects, it appears that shallower wells and handpumps are the way to go. Even the ancillary activities should be created as a model. The plan for well maintenance appears solid, but I do not think one day of training of community members will suffice. Program application needs to be expanded. There are a lot of unanswered questions and confusion.